On Friday, November 20th 2015 the Cleveland City Planning Commission voted to adopt the Canal Basin Park Framework Plan, which sets the direction for a new 20-acre park in Downtown Cleveland. Canal Basin Park will be a year-round public place that brings together history, neighborhoods, and the community. It is located where the historic Ohio & Erie Canal entered the Cuyahoga River, below the Veterans Memorial Bridge. This site is unique as Canal Basin Park is the only place in America where three national heritage designations overlap: a National Heritage Area, an America’s Byway, and an American Heritage River. Canal Basin Park will be Cleveland’s gateway to the Ohio & Erie Canalway National Heritage Area and the Northern end of the 101-mile Towpath Trail. Canal Basin Park will introduce a new model park within the National Park Service’s National Heritage Area program, one that offers visitor orientation and interpretation through a unique mix of modern technologies and public art. Canal Basin Park will also present the opportunity for the National Park Service to a have a presence in Downtown Cleveland. 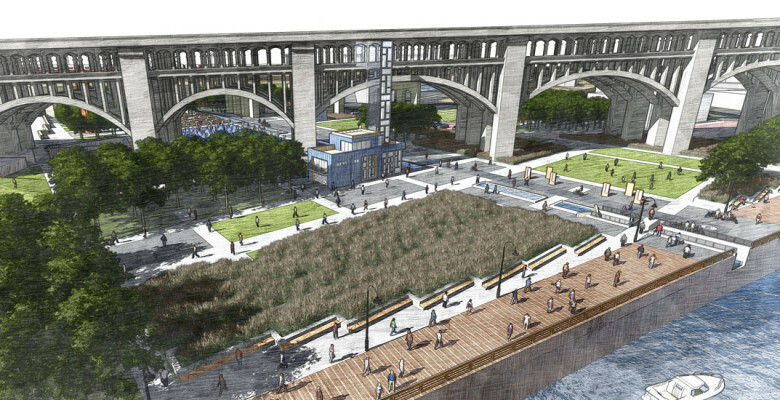 The City of Cleveland is the project manager of Canal Basin Park, and the Park will support the Connecting Cleveland 2020 Citywide Plan. Canal Basin Park will provide waterfront access for all, promote neighborhood connectivity via bikeways, and provide access to public housing. The Canal Basin Park Framework Plan synthesizes the best elements of 25 years of planning. The document will help to guide the development of the Park, and set parameters for the final design. Site improvements are already in the works in the Canal Basin Park footprint, the Cleveland Metroparks will improve 1.5 acres by the summer of 2016. The Northeast Ohio Regional Sewer District will create new riverfront access and remove the VanDuser building as part of their Superior Avenue Pump Station project. This entry was posted in Announcement, Blog and tagged Canal Basin Park, Cleveland, Cuyahoga Valley National Park, Flats, Heritage Tourism, Regionalism, Towpath. Bookmark the permalink.